This entry was posted on October 6, 2013 by Tintean Editorial Team/fdg, in Book review, History and tagged human-rights, Mary Robinson, women Ireland. Bookmark the permalink. 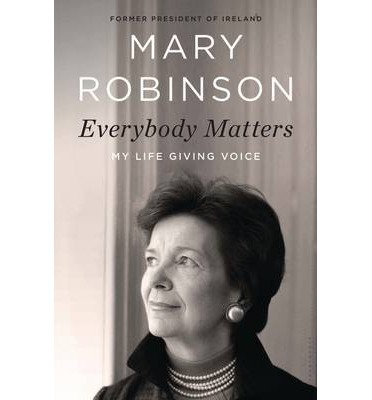 Many Tintean readers, I am sure, will have followed the career of Mary Robinson, first female President of Ireland, and second UN High Commissioner for Human Rights, with considerable admiration. In this highly readable memoir, Mary, in conjunction with her daughter, Tessa, narrates how a ‘reserved freckle-faced bookworm’ (p 26) from Ballina ‘a small town in a small country on the western periphery of Europe’, became one of Ireland’s most recognisable and celebrated leaders, both domestically and internationally. The memoir is structured chronologically, as Mary reflects successively on her family life, her primary and secondary education, the year she spent in Paris at a finishing school in 1961 at the age of 17, which ‘changed my life profoundly’ (p.24), her gaining of a scholarship to Trinity College, Dublin , where she chose to study law (Chapter 3), a year at Harvard University, her joining the Western Circuit of the Irish bar, her appointment as Reid Professor of Constitutional and Criminal Law at Trinity, her election to the Irish Senate in 1969, her marriage to Nick Robinson on 12 December 1970, her pregnancies, her time as a city councillor in Dublin, her legal career, her election as President in 1990, her appointment as UN High Commissioner for Human Rights in 1997, her work with the Global Elders Group organised by Nelson Mandela, and the establishment of the Mary Robinson Foundation for Climate Justice. What is particularly interesting about her career is that the two major roles for which she is remembered ‘came out of the blue’, provoking an initial ‘no way’ response from her –see pp128-130 on the Presidency and pp.197-199 on the UN job. This continued to the end – the invitation to join the Global Elders Group ‘we neither foreseen nor expected’ (p.302). Central to the narrative is the way it demonstrates how Mary’s reported youthful discomfort with the prevailing attitude at Miss Ruddy’s primary school: the students there ‘were somehow “better” than the majority of children in Ballina who were going to the convent school’ (p 11), coupled with the opening of her eyes towards poverty in the developing world by the nuns at Mount Anville (p 21) underpinned her career whose focus became the improvement of the lot of those who were either disadvantaged or discriminated against in some way. Very early on, Mary became committed to ‘the potential of law to be an instrument for social change’, recognising increasingly, the need to change the Irish Constitution and laws to give space to private morality (pp 44-45). As a member of the Irish Senate in 1971, she successfully challenged the law prohibiting the sale, supply and distribution of contraceptives in Ireland (p 71). Her early legal career involved cases where she took up the cause of women: for example, the brave Josie Airey (pp 101-111) and couples, Roy Johnston and Janice Williams-Johnston (pp 115-118), discriminated against by Irish law. More famously, as a barrister Robinson played a leading role in the David Norris case which challenged Irish law criminalising certain homosexual activities (pp 119-121). On a broader scale, what is interesting about these latter three cases is the way in which Robinson used the framework provided by European Community Conventions to challenge Irish law. Here there is an interesting thread: Robinson’s thesis at Harvard dealt with European Competition Policy (pp 53-54); she later became convinced of the need for Ireland to ‘join’ Europe (p 80), having served as Irish member of the Vedel Committee, established in 1971, to examine the question of the expansion of the European Community (p 79). The impact of Europe on Ireland can be seen to be profound. This innovative approach to public policy continued throughout her term as President of Ireland – a ‘President with a Purpose’ (Chapter 9), and as UN High Commissioner. As President, for example, she committed to reaching out to the Irish diaspora (pp 157-158), to facilitating the Northern Ireland peace process (pp 172-177), and to addressing the issue of human rights world-wide (pp 179-185). As UN High Commissioner, she travelled to most of the world ‘s trouble spots – 115 trips to seventy countries in five years (p 228). Not all of Mary Robinson’s endeavours worked out as well as she hoped: her years as Dublin city councillor she thought ‘not…particularly successful’ (p 103), and she unsuccessfully contested the seat of Dublin West in the Dail in 1981 (pp 103-105). In describing her work as President or UN High Commissioner, she addresses head-on the difficulties she faced, for example dealing with the US walkout from the World Conference against Racism, Racial Discrimination, Xenophobia and Related Intolerance held in Durban in 2001 (pp 157-158), and the impact of 9/11 (pp 264-269) which led the US to oppose her reappointment as UN High Commissioner (p 271). A strength of this memoir is the way in which it acknowledges the personal and political challenges Robinson faced along the way. Her relationship with her parents became difficult when she began to challenge the received norms of conservative Irish culture after her time in Paris – they opposed her marriage and did not attend her wedding (pp 65-68). Her proposal to legalise contraceptives met with ‘fury and venom’ from the Catholic hierarchy (p 73), and she similarly met opposition when she attempted to reach out to Gerry Adams as a first step in the Irish peace process (p 174). In her early days as UN High Commissioner, her major challenge was to rejuvenate the spirits and commitment of the overworked and disgruntled staff (pp200-202). The only downside of this memoir is that it ends abruptly with a description of Robinson’s work with the Global Elders Group organised by Nelson Mandela which often played a role in difficult conflict situations across the world, and in dealing with discrimination against women and girls (pp 302-314), and with the work of Realizing Rights on the impact of climate change on poor countries (pp 315-318). One would have hoped for a section brought together Robinson’s reflections on her experience and the keys to her success. Hints about this are scattered throughout the work , but a consolidation in a conclusion would have provided more insight. But this is a minor quibble about an important and inspiring work. Bob Glass is an occasional contributor to Tinteán, its secretary during the print years, and an economist and historian by training.